Hopefully this fun behavior incentive will offer some positive reinforcement for great behavior in the month of November. I have listed this as a k-3 incentive program, but after reading the description, you can decide if it is suitable for your students in other grades. Click HERE to check out “Rudolph has Arrived” for December. For the November program, all you need to do is provide the "Thankful Turkey" . The turkey will make an unexpected arrival to the classroom. It can be ceramic, stuffed animal, or you can use the colorful paper one I have included. With this program, you will have the turkey arrive as close to November 1 as you can, but really any time in November will work. When the turkey arrives, he will have with him the original poem I have included, written by me. :-) It introduces the kids to what will happen. 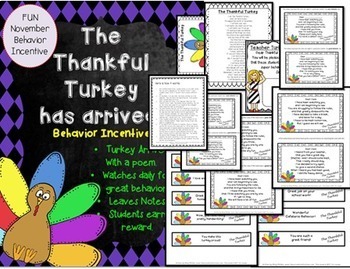 Using the poem, you will decide what the kids will earn for their great behavior. Throughout the month the turkey will leave notes for for kids. These are all included in the pack. *Note for when the turkey comes back.